php | Hi. I'm John. I’m in the process of moving my videogaming blog, GameBlaster64, over to WordPress. The most recent security vulnerability with Drupal coupled with the fact that core updates must still be done manually has pushed me to head in that direction. Drupal has always been a lot more work than WordPress and I didn’t really need all the extra functionality anyway. In under a month, GameBlaster64 will be 4 years old. There are hundreds of posts, thousands of pages, and tons of images. It’s going to be 301 redirect galore. To help with this, I wrote a small PHP script to grab the URLs of the taxonomies and articles I’ve been writing. It uses WordPress functions to import blog posts, along with their attached tags from the Drupal 7 database. Here is my script. If you’re moving from Drupal 7 to WordPress, you’ll hopefully find it useful. If you’d like to develop PHP and MySQL web apps in Linux but you’re not sure how to get started then feel free to follow along with this blog post. For the most part, installation and configuration is simple and straightforward. Though this article is directed toward users of Mandriva Linux (my Linux distribution of choice for a desktop / web-development PC), the same instructions can apply to many of the different Linux distributions including Fedora, Red Hat Enterprise Linux, Ubuntu, and Eeebuntu. For a huge list and up-to-date news of Linux distributions available to you, take a look at the Distrowatch news site. The easiest way to install all of the software in the LAMP stack (Linux Apache MySQL and PHP) quickly is to do it using the command-line (also known as the console). Since many new users are uncomfortable with the command-line, feel free to do all of these installations graphically using the software installer from your respective distribution. If you’d like to proceed using the graphical installer built into Mandriva Linux, use the “Install & Remove Software” icon located in the main menu. Once the software has been installed, you should be able to open up Firefox and navigate to http://localhost . This should bring up a screen that says “It works!”, meaning that apache has been properly installed. Note that this operation is definitely not secure if you plan on actually hosting your website on the live Internet using this computer, but for local development you should be okay. :) To learn more about file and directory permissions in Linux, take a look at the official documentation. Using Firefox (or whatever browser you normally use) navigate to http://localhost/phpmyadmin . Log into MySQL with your “root” user and the password you just entered into the command-line. This should give you access to your MySQL databases. For more information on how to use phpmyadmin, take a look at the official website. Hopefully this has given you enough information to get you up and running. Please feel free to post comments if you’ve run into problems and hopefully I or another person in the community will be able to help you out. Have fun with PHP on Linux! I just wanted to quickly post a link to a totally fantastic article I found about using the Singleton pattern for a database object. This is one of those times as a blogger where instead of re-inventing the wheel by writing about a similar subject you’re just better off setting your users up with a link to the best of the best and let it stand on its own. If you’re interested in learning more about the Singleton pattern, look no further. I’m using a database class based off of the code in the article for a few of my projects currently, and I have to say, it works great. Let me know what you think! When I develop at home and at work I use Aptana Studio. I purchased a license for myself at home and I use the community edition (read: free version) at work. It’s a wonderful editor with a ton of features and great community. One thing it lacks, however, is a good set of themes, out-of-the-box. So what, you ask? Just go and download some third-party custom themes from the web! Pishaw! It’s not that easy. I’ve done a few Google searches but not a whole lot turns up, to be honest. And that’s a shame because I bet a lot of developers are in the same boat as me. I’ve been tinkering with themes over the past few weeks and I’ve decided to start releasing some on my site for everyone to use. The themes page will grow over time as I continue to release themes. I’d appreciate any feedback you have. The Aptana Themes page is not only for my themes, they also include some of the best themes I’ve found around the web. If you have a theme you’d like me to put up, send it to me and I’ll do just that. Anyway, without further ado, I present the Aptana Themes page! Notice how the first include() statement refers to a file in the “includes” directory, one directory down from the file calling it (in this case index.php). In the second, the include() statement has the entire path to the file right from root. #1. It makes server management easier, faster, and cheaper. During the lifetime of a web server, the web files may need to be moved and/or directories renamed. Imagine what would happen to your website if you were to rename the “project” directory to “old_project”? You’d have to go through all of your scripts and rename the project directories in the include() statements in all of your scripts. Using method 1, everything keeps on working with no updates to your scripts. #2. It makes moving your site to another server easier, faster, and cheaper. If while maintaining your website you end up switching which VPS company you host with or you change the operating system on your server, you could find yourself in a position where instead of having your web files located in the /var/www directory like most Linux distributions you have them located in the /usr/local/www directory like some BSD installations. In this case you could use symlinks to forward requests of /var/www to /usr/local/www, change your apache configuration to put your web files to /var/www, or update all of your scripts so that they have the correct path. For now. All of those things feel like hacks. Best thing to do is just to code from the start with relative paths, thereby avoiding all of these path problems. Recently in the world of programming blogs there has been a string of articles by disenfranchised developers bemoaning their current work environment in a sarcastic and ultimately unproductive manner. I understand and appreciate sarcasm and tongue-in-cheek humor but what I have seen lately goes above and beyond simple satire to a new level of pessimism that in the end is more about self-serving venting than anything enjoyable to read or to learn from. At first I shrugged off the first article, which was a negative play on a post I made last week, thinking that perhaps the writer had a bad day and was simply going a bit over-the-top. But then another post by a different author came up on DZone in the same light. And then another. I then started to wonder why there was this growing trend into negative venting blog posts, where their only function is to belittle other peoples’ efforts and cause as much controversy as possible surrounding that subject. When I started this blog I made a choice: I wanted to prepare and post articles that people could read and learn from or to be more realistic, to offer them alternative channels of thought so that they can continue their research until they find the solution they require. I have made a personal choice to be an optimistic programmer, meaning I understand that while there will be times that I am incorrect or times where my example code was not the most efficient it is more important to accept that and learn to grown from it, moving onwards and upwards, than it is to be negative and post with the only intentions being to vent and complain without offering any sort of solution or assistance. There have always been trolls on the internet. There always will be. The best thing I believe we can do as bloggers is to call it what it is and try to be above it by taking the good points of a negative experience and growing from it, not brooding over it. If you’re into developing websites chances are there will be sometime during your life/career when you’ll need to have users enter data into a HTML form but you have no idea how many of a certain variable they’re going to be sending in or how much data they’re going to fill in of the same type. That all looks fairly normal. Keep in mind this is a simple example. But, what about if you’ve got the option to enter 10 friends. What about 20? You might have to re-work your form if you want to enter 20 friends. Any more than 10 and you might want to look at alternatives like importing from XML or CSV. When you submit this form then you’ve got to check each input box to first ensure they entered a variable and then check to see what that variable is. With so many input boxes to check from it becomes a repetitive and arduous task. // There's got to be a better way! Let’s walk through that PHP code. It’s fairly simple. We walk through the php $_POST[‘friend’] array that we retrieved from the HTML form using foreach and for all of the entries on the form that the user typed in we do something with (in this case we simply echo them to the screen). This simple foreach loop will save you time and the good part is that you can have any number of friends on your form (I’m sure there’s a maximum somewhere though.. 256 maybe?) and this block of code will still work. In the next article I’ll show you how to do the same thing with ColdFusion. I’ve been looking for a handy/graceful way to do this for a while and I thought I’d share this little php trick with you in the hopes that it’ll save you some time if you ever need it. If anyone reading this can quickly convert this example into other languages such as perl, coldfusion, ruby, c, c++ please be my guest and post it as a comment or as a trackback to this blog. I wanted to scrub any characters out of a string that were not alphanumeric. That is, not “a” to “z” and “0” to “9”. Thankfully, PHP has extensive regular expressions support so that’s what we’ll use. I needed to store files uploaded through PHP on my Linux machine using a filename chosen by the user. A web site I’m working on requires users to upload media (images, video, music, et. al) and in order to save the files on the hard disk. This functionality prevents code failure by making the filename valid in UNIX filesystems. * Converts a string to a valid UNIX filename. Then, we simply walk through the array replacing the offending character with nothing using the PHP function str_replace. If you use the Smarty template engine for your site then you can take advantage of the included output filter Smarty plugin called trimwhitespace. Trimwhitespace is an output filter, which is basically a plugin that runs after your source code has been created but before it gets displayed or put into a cache file. The premise for trimwhitespace is simple. Most HTML source code for most websites includes whitespace put there by the web developer for readability. Since this whitespace is not required for the website to display and takes up needed bandwidth, we can eliminate it. Enter trimwhitespace. An added benefit is that while the user recieves a trimmed copy of your HTML source code, you can still see your source in its fully tabbed and spaced glory by examining your template files. It’s a win-win situation! Fear not my fellow web developers, web designers, programmers, whateverrers! These 5 Firefox Extensions will help you chop the time spent on any web development task so you can get back to reading blogs during the day. Or work. You choose. A ruler you can use to measure the size of tables, divs, or anything else on your page. Disable stylesheets to see what your site looks like without any styles whatsoever. 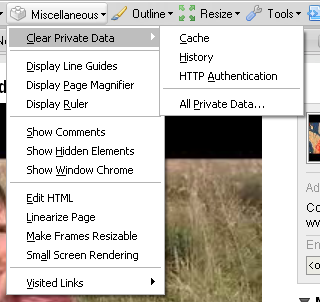 Display alt tags, image file sizes, image paths, and more. “Outline Block Elements” will automatically outline divs, paragraphs, spans, and other elements on your site. Very handy. 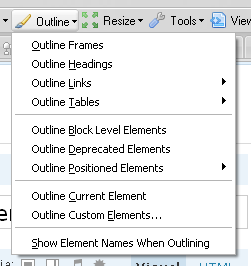 “Outline Current Element” will display the element id and name for any element underneath your cursor. Unbelievably handy. I’m sure we’ve all seen a cool color on a page, whether it’s an image or cell background, and said “Oh man I love that color. I could eat it. I wonder what the hex value is so I can use it on my site. Or in case I get hungry.” Well, you could always take a screenshot, load up The Gimp, use the Color Picker tool to determine the hex color value, but who needs to do that when you’ve got ColorZilla installed? ColorZilla will display the hex color and RGB value of any color under your cursor. Very, very handy. This handy little extension will show you the Google PageRank of whatever site you are on as well as the less-important-but-for-some-reason-still-used Alexa Ranking. This handy little Firefox Extension will tell you which CSS styles are not found on your pages. It works per domain, so surf all of the pages of your site and a comprehensive collection of unused styles will be shown which you can then promptly delete from your stylesheet, thereby increasing the performance of your site. No Web Developer’s tool-belt would be complete without the illustrious Firebug. The list of features here is incredibly long, but so is the list of Web Developers who have saved hours of work using it. Their own website explains it better than I would but you’ve got to ask yourself one question: What kind of web developer are you if you aren’t already using this?? I hope you’ve enjoyed this list and found some of the links useful. If you’ve got something to say about these tools or even have a list of handy tools you use that might think others would find useful, please post a comment with a few links. Thanks! If you need to use a command-line program to convert between different movie or media formats, it’s likely you’ll end up using ffmpeg. ffmpeg is the de facto standard for converting file formats in *nix and FreeBSD environments. Using the program from the command-line is like using any other program. There are a large amount of switches and options you can use to change the functionality of ffmpeg, including video resolution, video quality, audio compression and quality, framerate, and more! There are many ways to download ffmpeg. Many vary on your distribution of Linux or other Operating System. In many cases, ffmpeg may already be installed and ready for you to use. For Mandriva users, ffmpeg is available using urpmi or the “Add/Remove Software” program in the control panel. This will convert your movie to Flash video (.flv extension) at the same resolution it went in as (for example 480×392 pixels in width and height), deinterlace the video, set the audio frequency to 44100 (high quality), the video framerate to be 25 frames per second, and set the video quality between 3 and 6, which will give you very good yet quickly servable results. If you’re shipping this video on CD or DVD you can set the qmin and qmax values lower (lower = higher quality) but for streaming video this is very, very good and very close to the original without being massive in size. In fact, the one thing that requires some explanation are the qmin and qmax values. It’s a slightly complicated subject but can be easily explained by thinking of qmin and qmax as how much quality you want to take away from your video, between those two numbers. The minimum qmin and qmax is 1 and the maximum is 31. If the video size is too large after using this command example and you would like a smaller file, try increasing qmax first until you reach it’s maximum. It’s likely that you will find a happy number in there without having to adjust the qmin value. It’s fairly self-explanatory, but the above script simply fetches a list of all of the files in the current directory and executes the ffmpeg program for each file in that list that has the extension “.mpg”. It should be noted that converting between different video file formats may require a license to do so by the patent holders of that file format. Be sure that you have dotted your “i’s” and crossed your “t’s”. This is really handy for those of us who have the same code handling multiple sites or multiple sub-domains. A case in point: When I coded NetBoardz (my free forum hosting service now defunct), I had one codebase handling all 250 forums. How? Simple. When the code runs, it determines which site the user is loading and does different things (like using different databases) dynamically. In the example above you can see that we have put the domain that the user has used to view your site into the $domain variable, loading the value from the PHP global variable, $_SERVER. The $_SERVER variable is global, which means you can access it anytime and anywhere in your code. More information on PHP’s predefined global variables. Here you can see that we retreived the whole hostname, including the top-level domain and subdomain, then used the PHP functions strpos and substr to take anything before the first dot. For example, the whole hostname “testforum.netboardz.com” passed through this code would end up as “testforum”. After, we use that subdomain name to calculate which forum database to load. Of course, once you have the domain or subdomain in a variable, you are able to handle your code as you wish! If you’re ever in need of a regular expression that will validate every domain name to make sure what the user gave you is valid, you can use Shaun Inman’s Regex. I have to admit, while it’s pretty uber, it’s probably easier just to use cURL to see if the URL is valid. To accomplish website validation using cURL, there is a snippet of code available on the official PHP homepage: http://ca3.php.net/manual/en/function.curl-exec.php#77167. If the HTTP status is 200 after requesting the website using cURL, the website is valid. If not, you can return an error to the user to verify their URL.